Selecting the right excavator can make a huge difference to the profitability of your business. If you are working on today’s smaller blocks, townhouse and cluster dwelling sites, these sites often have very tight access. The pressure of having to work in ever-smaller areas has sparked a big demand for small, nimble machines with enough power to get the job done profitably. Mini and compact excavators have become essential tools. Many purchasers of small excavators tend to be first-time buyers and may not be aware of the differences in machine design that will be critical in providing the performance or specialisation needed for their business. When evaluating your equipment options, you need to understand the small, yet significant differences that can make a big impact on how you satisfy the needs of your customers and keep the dollars in your pocket. At first glance, people unfamiliar with excavators may not see what really matters. As with any machinery, a closer look reveals many significant differences in the design, manufacturing quality, components and performance between models and brands. Price is a good indicator of quality. Buying a lower cost machine may not be the most economical investment in the long term. It’s like choosing between the handyman and the tradesman’s version of power tools. You need to buy the best quality if you’re going to be using it all the time and your income depends on it. In the past, choices in machines of this category may have been limited, however market demands have guided Takeuchi’s decision to produce a range that have specific attributes and advantages, depending on the needs of different contractors. Takeuchi offers four different excavators that are based on needs such as transport method (trailer or truck), physical dimensions and weight of the machine; critical basics in deciding what machine is the best for your purpose. For example, when you add the weight of attachments such as a hammer and auger to the buckets you may need to carry, a 2-tonne excavator may exceed the regulation road weight. Dimensional capability is a major issue. For example, is the machine going to operate within the constraints of the job site? Addressing this requirement, Takeuchi excavators are supplied in four models with retractable tracks, one of which retracts to a very handy 740mm in width. 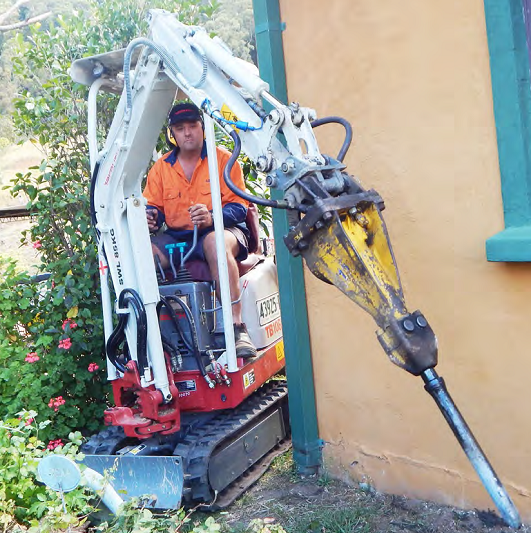 Short radius or short tail swing machines become attractive on tight sites, However, a machine with a short tail swing will generally have a shorter reach or dig depth to compensate for stability, therefore it’s important to have a good idea of how deep you may need to dig, or how often you may need to dig at maximum depth. Unless you have the right effective bucket reach, you may need to constantly reposition the excavator to dig a deep trench, which may add extra time to the task. Reach is also critical when side loading a truck. Most machines have standard features such as a swing boom, dozer blade, and options such as a hammer circuit. When adding attachments such as an auger, you need a hydraulic circuit that can do both these jobs efficiently. 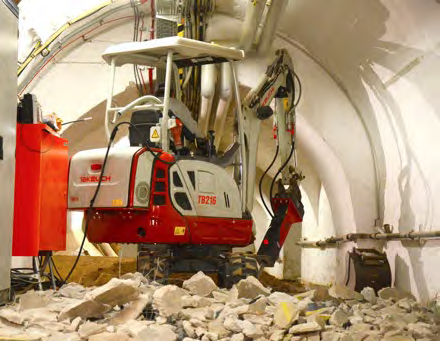 Some machines can power an auger and a hammer but lack the capability to switch hydraulic circuits to one-way, a mode needed to operate a hammer or rock grinder. 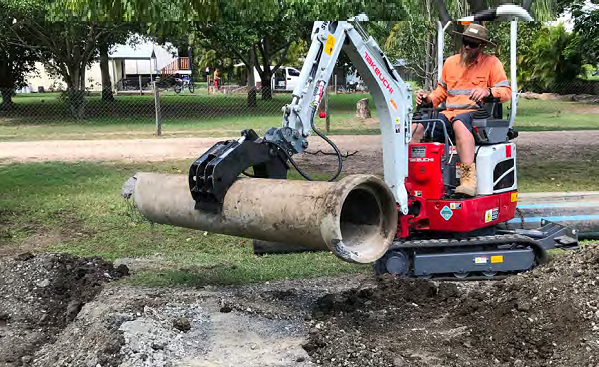 All Takeuchi excavators have auxiliary circuits with ball valves that enable convenient connection of attachments, helps prevent fluid spillage and increases the efficiency of the hydraulic circuit. This important feature contrasts with some inexpensive machines that use basic hydraulic plugs. Many machines have rubber hydraulic tubes instead of well-engineered steel tubes, however all Takeuchi excavators have fully protected steel hydraulic tubing. On sub 2-tonne excavators where the operator is in close proximity to the bucket, smooth operation is critical. When manoeuvring to perform precise cutting actions, jerky movements are transmitted to the operator, making for very tedious and tiring work. Takeuchi has developed and perfected its own hydraulic valving system that provides an operator with very smooth and precise control. All its small excavators have automatic load-sensing; two-speed travel systems, which protect the hydraulics from overload on steep grades. This system auto shifts to low range then back to high when the load decreases. There are many invisible, yet performance-enhancing design features, including triple flange bottom rollers that reduce the danger of de-tracking when machines are traversing slopes. Features like these add value to the machine, contributing to lower maintenance costs, longer operating life and higher resale value. Takeuchi invented the mini excavator and produces 22,000 machines annually. They are very durable machines that provide an extremely long working life due to the exclusive use of premium-grade materials and components, manufactured to the highest engineering standards. These Japanese machines are designed for a service life of 10 to 20 years. Even the smallest Takeuchi machine is designed to work 2000 hours per year, with 100 per cent of its production being exported. In Europe Takeuchi is the second largest selling brand and sits fourth in the huge USA market where the world’s largest rental company, United Rentals, buys more than 1000 Takeuchi machines every year.